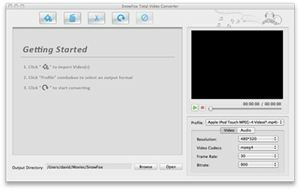 SnowFox Total Video Converter for Mac is a video converter for Mac OS X which supports converting between all popular video format and HD video format. Besides video conversion, it also can extract audio from video, convert video to audio and convert video to iPod, iPhone 4 or iPad supported video format. SD Video Converter for Mac – Able to convert videos to any other popular video format, such as avi, mpg, mp4, mpeg, wmv and etc. HD Video Converter for Mac – Able to convert video between HD video format such as HD AVI Video (avi), HD WMV Video (wmv), HD MPEG-4 Video (mp4), HD MPEG-2 Video (mpg) and HD H.264/AVC Video (mp4). Video to Audio Converter for Mac – Able to extract sound track from a video file and convert to audio format such as aac, ac3 and mp3. Batch conversion supported – Able to batch import several videos at a time and convert to a certain video format. Compatible with Apple family -iPad, iPad 3G, iPod, iPod nano, iPod shuffle, iPod classic, iPod touch, iPhone, iPhone 3Gs, iPhone 4, Apple TV and etc. Compatible with other video players – Android-based Phone, Mobile phones, Zune, PSP, PS3, BlackBerry, MP4 players and etc. User interface – Simple and easy to use. Visit SnowFox Total Video Converter for Mac promotion page, then enter your email address and click “Summit” button. Download SnowFox Total Video Converter for Mac: video-converter-mac.dmg. Use the received keycode to unlock and activate SnowFox Total Video Converter for Mac.